This monograph and selective anthology serve to introduce the most immediately accessible and compelling playwright of the ancient Greek theater. The only volume of its kind available, it provides a rich selection of core plays and a substantial introduction to the full scope of the Euripidean corpus. In "Mortal Vision" Meagher endeavors to strike the core of what he takes to be Euripides' abiding concerns: war, the plight of women, and the awful mystery of the gods. The five plays selected for inclusion here embody those concerns as fully and powerfully as any in the Euripidean repertoire. Finally, in "Revel and Revelation," Meagher looks back at Euripides' consummate masterwork, the Bakkhai, as a definitive response to the ancient quip that Athenian drama has little or nothing to do with Dionysos. Nothing could be further from the truth. A monograph on Euripides entitled "Mortal Vision: the Wisdom of Euripides"
A concluding essay entitled "Revel and Revelation: the Poetics of Euripides"
Robert Meagher’s able translation and insightful introduction illuminate Euripides’ tale as never before, showing that the past is not past, and that the darkest and brightest truths never change....highly recommended. A book surely destined to become a historical point de depart in thought and understanding — a remarkable achievement! … There is in Meagher a rare touch of genius. He is not only a great scholar, but a great humanisit in the full, positive sense of the word. In Robert Emmet Meagher’s translations, Greek drama springs to life with poetic immediacy, elevating the past into a timeless present. He renders Euripides not only readable but extremely actable. ...Meagher, focusing only on Euripides, combines a monograph with translations of five plays. This is an excellent idea in principle, though with some flaws in practice. Meagher begins with a book-length treatment (150 pages) of Euripides and his theater, previously published as Mortal Vision: The Wisdom of of Euripides (St Martins, 1989). Then follow translations of Hekabe, Helen, Iphigenia at Aulis, Iphigenia in Tauris, and Bakkhai. 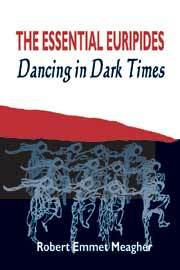 This is a wonderful selection of plays, covering both the comic and the tragic sides of Euripides. Hekabe and Helen give two sides of the Trojan War Story, and the two Iphigenia plays are also a Natural pair. Meagher characterizes Euripides as an Athenian, a "scholar", and a playwright. By "scholar" he means not only that Euripides was learned and widely read but, more importantly, that he was involved with the new philosophical thinking being introduced in the later fifth century, and that thinking in general- reason, argument, questioning everthing- are central Euripides' plays and to his way of looking at the world. This is one of the most striking differences between Euripides and his older contemporary Sophocles, and Meagher's discussion is good here. ... The translations are all in free verse. They are presented without line numbers, a significant inconvenience for anyone wanting to use this text to check a reference from another book, and even worse for students who might try to cite these translations in a class essay. I am surprised that a scholarly, teacher-friendly publisher like Bolchazy-Carducci did not insist on this necessary tool alongside the text. Two factors prediposed me to enjoy this book. One of them was its dedication to Lou Bolchazy, its publisher. USA's answer to John Betts, Lou has served the cause nobly by making available a large number of highly usable books. The second was the fact that M tells us that the individual who set him on his Euripidean way was the film director Michael Cacoyannis. I remember vividly the first ever screening in the UK of Cacoyannis' Iphigenia. This took place at the National Film Theatre, and before the film started the director bounded on the stage and said with a quiet but intense conviction that Euripides was still alive. Inspirational words - and true! M's book consists of a number of essays on the playwright and the translations of 5 plays (Hecabe, IA, IT, Helen, and Bacchae). In the essays, the writing can see portentous - the title is fairly characterisitic of the tone - and M tends to tease things out at some length. Crispness and pithiness are not often to be found in these pages. But they are certainly readable, and M hits a number of nails very decidedly on the head. he also makes splendid use of the fragments. The translations have a sinewy directness that communicates much of the plays' immediacy and power. As Cacoyannis observesm 'He renders Euripides not only readable but extremely actable.' Those who wish to stage one of these plays should give M's translation serious consideration.